Indian police arrested a man whose stinky socks caused a showdown on a bus as his fellow passengers protested the pungent odour, an officer has said. 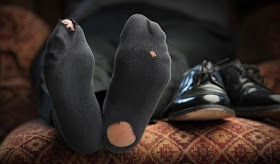 The man removed his shoes and socks on a bus going from the Himalayan state of Himachal Pradesh to New Delhi and put them near the aisle, police said. Other passengers protested and asked the man to put away the offending socks or throw them out. The man refused, sparking a heated confrontation that forced the bus driver to stop at a police station in Una district of Himachal Pradesh. Una police chief Sanjeev Gandhi told AFP the bus stopped several times because of the smelly chaos before they came to the police station. “He was arrested on charges of causing public nuisance and later released on bail,” Gandhi said. Gandhi said the accused had threatened other passengers and caused a disturbance at the police station. The man in turn filed a complaint against his fellow passengers and the bus crew for harassment and insisted his socks did not smell, the officer said. He left the area in another bus a day later, police said.